The hotel has an elegant restaurant with a wonderful view of the lake. In the summer there is the possibility to eat from the excellent menu on the wide terrace directly overlooking the water. The restaurant is a further example of the refinement and professionalism of the Hotel Metropole. In the kitchen attention is paid to detail and the use of high quality products in order to offer the guest a wide range of dishes of the best of both Lombard and international cuisine. Impeccable service is guaranteed from an efficient and cordial staff. Remote paths in the mountains and hills which surround the lake. Cycling – hire mountain bikes and do the" Giro del Lago" or tour of the Lake. Visit the exquisite gardens of the Villa Carlotta in Tremezzo just a short hop across the lake by hydrofoil. Daily Market – fresh fish, fruit and vegetables plus souvenirs abound in the Bellagio daily market. Switzerland – cross the border and check out the picturesque town of Lugano. Golf in Lake Como – The Lake is home to one of Italy's most famous golf clubs - The Golf Club Menaggio (just a short hop across the lake). Bellagio – there are lots of things to do and see as the town is one of the most picturesque on the Lake containing a couple of beautiful villas including Villa Serbelloni. There is a beach only a few minutes walk from the Hotel - see the concierge for the best tips on whtten and where. Dine on fresh lake fish whilst enjoying fabulous views of the Lake and soaring mountain gorges. Our rootop terrace contains sunbeds and parassols for free use by our hotel guest's. 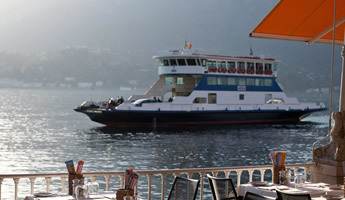 There are 2 Boat Stops only 20 metres from the Hotel which serve almost all of the Lake's major destinations. Additionally the bus stop connecting Bellagio with the town of Como is only steps away. 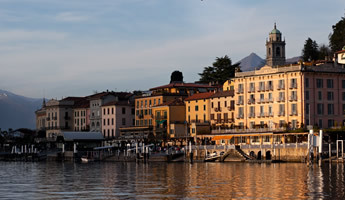 For more information see Lake Como Attractions. Full buffet breakfast is included in the room rate – cereals, coffee, ham, eggs, salami, yoghurt, teas, bread, rolls, jam, marmelade, hot and cold milk, home made pastries and cakes,fruit juices etc. 12-hour room-bar service 8:30 a.m. – 20:30 p.m.